What inspires me: Watching people enjoy the ocean when they may not otherwise have had the opportunity. Best advice: Be the person you would want to be best mates with. It’s a sparkling summer day on a Perth beach as a 12-year-old boy contemplates the ocean before him. The boy is autistic. He has a brain injury. He can’t speak or hear. And a feeding tube is inserted permanently into his stomach. The boy is about to attempt surfing. The boy’s family huddle nervously around as he is carried into the ocean and placed, sitting, on a surfboard. A volunteer surf instructor sits tandem on the board with him, and it’s not long before the duo catches the first wave. The boy’s face erupts into an enormous smile, and he shoots his arms into the air in triumph. His mum and sister and brother, all surfers, are in tears. They had never dreamed their boy would be able to experience the exhilaration of surfing. 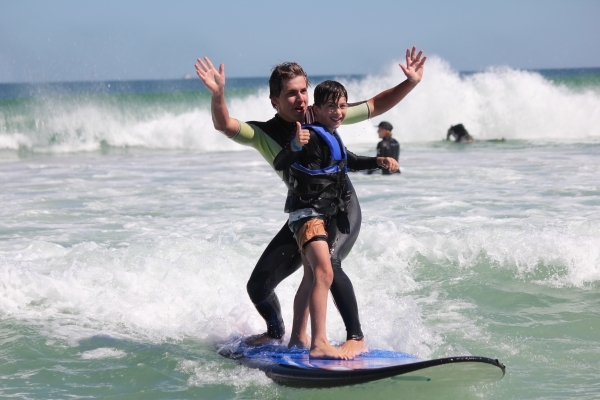 But, thanks to a new Perth charity, Ocean Heroes, this boy and hundreds of other autistic kids now have the chance to hit the waves. And, in doing so, they are not only experiencing a one-off thrill but revealing major shifts in their personalities. Once shy, anxious and depressed autistic kids are coming alive with the joy of surfing and blossoming with a newfound confidence that is reshaping their lives. 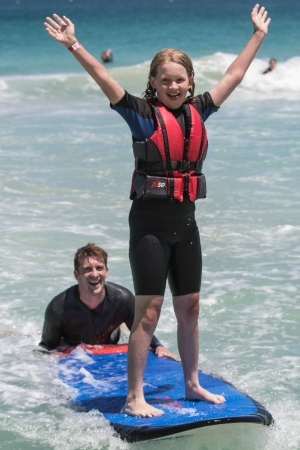 An Ocean Heroes volunteer helps an autistic kid experience the thrill of surfing. For Ocean Heroes directors Luke Hallam, Sam Moyle and Tom Johnston, the results have been mind-blowing. And they’ve become hooked on the joy of sharing their love of surfing with autistic children. But just how did this trio of young men come to launch a charity? Rewind eight years and Luke found himself taking on an unusual client in his job as a personal trainer – a shy, brown-haired, 8-year-old girl with autism. The girl’s mother wanted to keep her daughter physically healthy and enlisted Luke to teach her daughter in the gym. So successful were the training sessions that the girl’s mum spread the word. It wasn’t long before Luke found himself training 20 to 30 autistic kids a week. With no experience in dealing with people with disabilities, Luke says there were some “hairy” moments. But he came to admire the kids and their families. Which got him to thinking. What else could he do to help them? As a keen surfer himself, Luke wondered how the kids would fare in the waves? 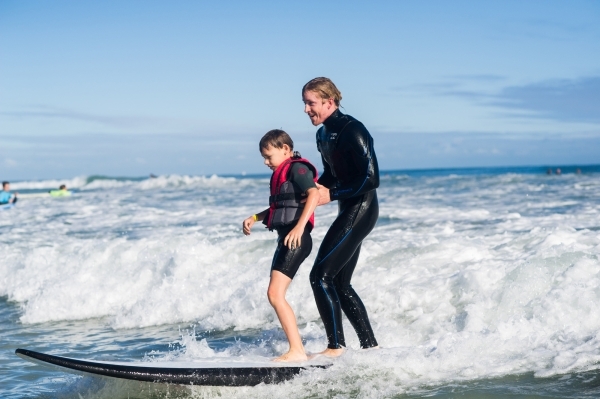 He took to Google to see if others had experimented with surfing for autistic kids and stumbled upon a Californian charity, Surfers Healing, which introduced autistic kids to surfing. It just so happened the charity was coming to Australia in the next few months, so Luke booked himself a plane ticket to fly across the country to meet them. So impressed was Luke with what he saw that he and a mate, Sam Moyle, decided to fundraise to bring Surfers Healing to Perth. They raised $20,000 for the trip and, in March 2016, invited some 200 autistic kids and their families to the beach. Happy days in the surf. 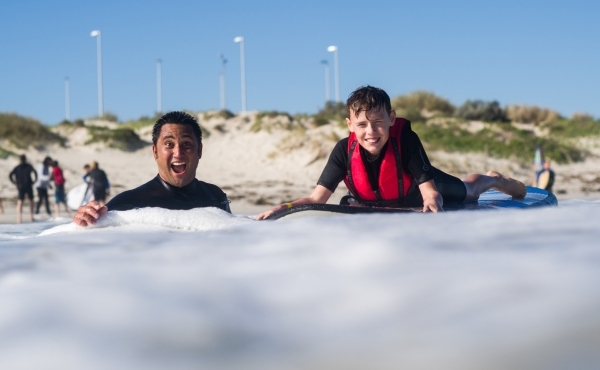 So pumped were they by what they saw, that Luke and Sam, and a recruit Tom Johnston, plotted how they could bring more surfing to Perth’s autistic kids. Raising $20,000 for an American charity to visit was unsustainable, so they decided to take it upon themselves. A few months later they conducted their first trial day with a group of about 20 autistic kids. So successful was the trial that the trio registered Ocean Heroes as a charity. They conducted their first event as a charity in September last year with 25 kids. The next month they had 50 kids. Each month the numbers grew until, at the end of the surfing season in April this year, they had 120 kids. 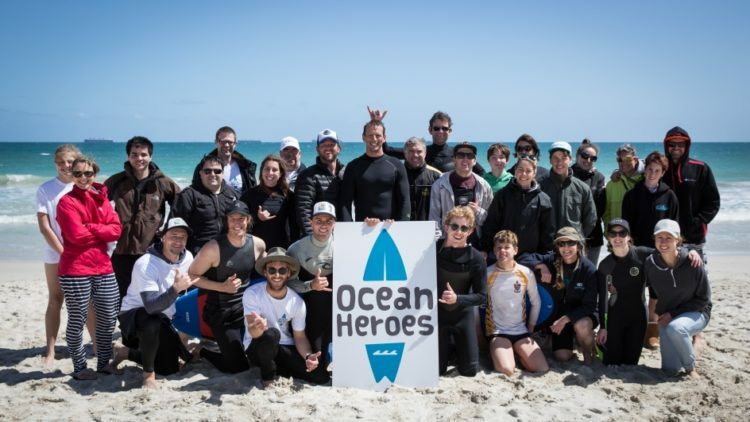 Next summer Ocean Heroes plans to give surf lessons to 200 autistic kids a month in Perth, as well as make several trips to Western Australian rural areas. Volunteers have inundated them by putting up their hands to help, but they need to raise money for more surfboards, lifejackets, and wetsuits. While learning how to operate a charity, and also maintain their careers, has been challenging, Luke, Sam, and Tom have each gained so much from their time with autistic kids. They say they are also continually inspired by the parents. You can support Ocean Heroes’ bid to bring surfing to more autistic kids by donating at www.givenow.com.au/oceanheroes and follow their work on Facebook and Instagram at Oceanheroes.